Renae Brumbaugh Green lives in Texas with her handsome country-boy husband, her noisy children, a rowdy dog, and a bunch of chickens and ducks. She's published more than 25 books and a whole bunch of articles. Her favorite color is blue, unless you're talking about nail polish, in which case her favorite color is bubblegum pink. Personally, I loved reading Nancy Drew as I was growing up, and this book kind reminds me of her mysteries. Of course, Nancy Drew was a little older than the girls in this book, who are just tweens - the oldest being fourteen. Nonetheless, these girls have no trouble sniffing out a mystery. 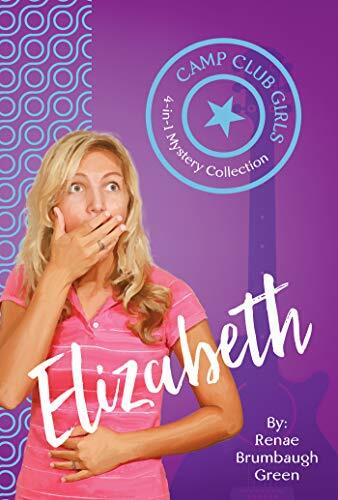 The first book in this 4-book combo starts out with the main character, Elizabeth, meeting several other girls at camp. They have a mystery on their hands and they become fast friends as they work together to solve it. It will draw you in from chapter one! As you read the other books in this series, you see that even though they are no longer at camp, the girls continue to be friends and consult with each other on mysterious matters that come up. The book is fun for young girls, contains a thread of faith, friendship, and more. I liked how Scripture was woven throughout, with enough food for thought to be an asset but not really overwhelming. I do believe girls who enjoy mystery and love to read will like this series. I think it promotes great faith values and friendships. My daughter really enjoyed it, and was so excited about it, she was telling her friends they needed to read it too! I received a copy of this book from Barbour. I was not asked to write a positive review and all opinions are my own.